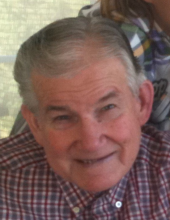 Harvey Louis Tesch, 88, of Finksburg, MD went to join loved ones in his Heavenly home on Thursday, January 31, 2019. Harvey was born on February 27, 1930 in Shaw, MS to the late Louis and Alma Martin Tesch. He was predeceased by his wife of 57 years, Gladys Pruente Tesch and by his brother, Edward Tesch. Harvey lived a full life. He proudly served in the United States Air Force and worked for more than 40 years with Bendix/Allied Signal as an engineer. He designed antenna systems and oversaw their installation. At one time he had been on every aircraft carrier in the Navy Fleet! He also worked as a contractor with the Goddard Space Center for a period of time where he oversaw their telemetry antenna systems in the NASA Space Shuttle program. A passionate servant for Christ, Harvey quietly devoted countless hours to his beloved church, Sandy Mount United Methodist. Among the many things he did for his church were recording services and taking them to shut-ins , visiting the ill and hospitalized, taking people to appointments, teaching Sunday School, leading the youth group, singing in multiple choirs and serving as a Trustee. He enjoyed church softball leagues and tells us he was quite the basketball player as a young man! Harvey is survived by his son Dan and wife Heidi and their children, Amber Caprio (Harvey’s great-grandsons Caleb and Liam Caprio), Tara Slagle (great-granddaughter Ivy Slagle) and Megan Tesch. He also leaves his daughter Cheryl and her children Brent Crum and Nicole Calogero, and son Jeff and wife Becky and their daughters, Allison and Amy Tesch. The family will receive friends on Sunday, February 3, 2019 from 1-4 p.m. at Pritts Funeral Home & Chapel, 412 Washington Road, Westminster. A visitation will also be held on Monday, February 4, 2019 from 10 to 11 a.m. at Sandy Mount United Methodist Church, 2101 Old Westminster Pike, Finksburg with a funeral service beginning at 11a.m. Officiating will be Rev. Kathy Altman. Interment will be in the church cemetery. A luncheon will follow at the church. In lieu of flowers, donations may be made, in Harvey’s memory, to Sandy Mount United Methodist Church, 2101 Old Westminster Pike, Finksburg, MD 21048. Online condolences may be offered to the family at www.prittsfuneralhome.com. To send flowers or a remembrance gift to the family of Harvey Louis Tesch, please visit our Tribute Store. "Email Address" would like to share the life celebration of Harvey Louis Tesch. Click on the "link" to go to share a favorite memory or leave a condolence message for the family.